We create this website as a project of our subject “Propietats i usos de nous materials per al disseny”. Our idea is to use cork because the extraction is sustainable and does not harm the ecosystem, to claim the massive and uncontrolled deforestation. Our project is to imitate the papers for voting, because when there are elections there is an excessive waste of paper. The political campaigns consume a lot of paper unsustainable and very worrying every four years. 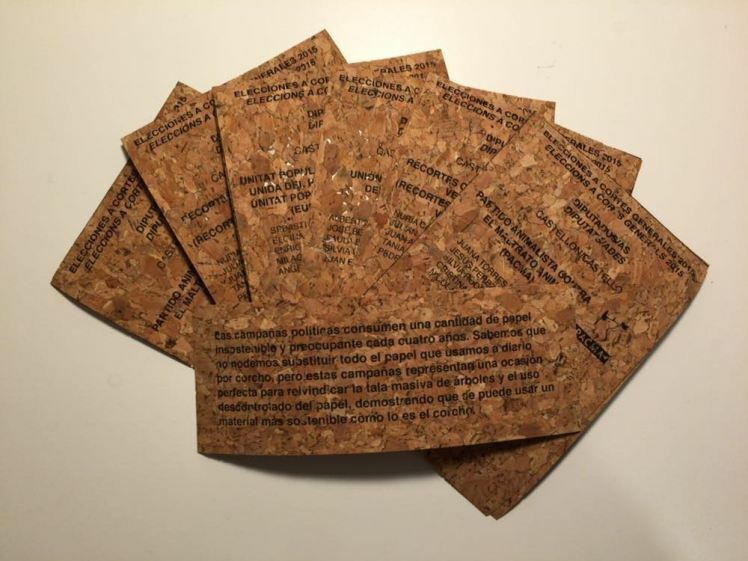 We know we can not replace all the paper we use every day for cork, but these campaigns represent a perfect opportunity to reclaim deforestation and uncontrolled use of paper, proving that you can use a more sustainable material as is the cork. We printed with screen printing this papers on paper cork. We hope that our project results interestinf and you can learn something new, as we made while we were working on it!